Video messages by Lord Ahmed of Rotherham, Virendra Sharma MP and Keith Bennett, a business consultant for North Korea and China drew from different initiatives of the Unification Movement. Keith Bennett shared his insight that the friendship of the Kim and Moon families would be highly significant for peace on the Korean peninsula. The video of the speech by Lord King of West Bromwich, UPF-UK Patron, at the Ascension ceremony in Korea brought spontaneous applause from the audience for its warmth and insight into the role of Father and Mother Moon. Pastor of the Bromley Unificationist community, Matthew Huish, shared that he was the fruit of the genius of Father Moon. Without his introduction to his parents he would never have been born. He cannot be but grateful for all the effort of Father Moon to train and then prepare his parents for marriage despite their different natures and backgrounds. In addition to the explanations of Unificationists and their testimonies of their insight into Father Moon's life the non-Unificationists added a different quality of perception usually from their faith backgrounds. Mr Kuldip Singh Ubhi shared how impressed he had been by the spirituality of the prayer room in Chung Pyong which is a Unificationist facility to the north east of Seoul where the Founder is now interred. Mrs Frederike Rice expressed how moved she had been as a long time United Nations Association member that Father Moon's vision for the reform of the United Nations included an inter-religious council at the UN. Prof. Natubhai Shah, a leader of the UK Jain Movement said, 'Rev. Moon is a remarkable person who worked for Family Values and global peace. He will be remembered for his zeal, passion and his contribution for interfaith, international work, and bringing people together of diverse communities. I was moved very much by his Memorial Service.' Dr Naznin Hirji, from the Ishmaeli community shared, 'I feel very emotional looking at this audience seeing people of all cultures and backgrounds, and this work of Father Moon alone moves me very much.
' Edwin Shuker of the World Sephardic Council, spoke of his pride in the 'Ambassador for Peace' award presented to him by UPF. (pic.twitter.com/3mI51edV) He shared that the march of hundreds of Christians, Muslims and Jews through the streets of Jerusalem, on the way to visit the holy sights of the three faiths together, had been an unforgettable experience for him. He recited one of the psalms of King David typically remembered during this time of year in the Jewish calendar that he also found suitable for the occasion. There were several moving items in the Memorial Service for Father Moon today. One such moment was Mrs. Sudesh Sharma describing her relationship with the Unification Movement as one of her Dad's last gifts to her. Her Dad, the late Mr. O.P. 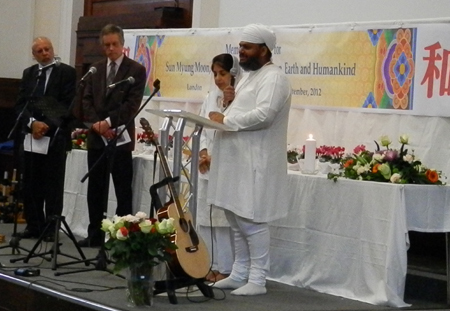 Sharma OBE, did so much to help us overcome injustice towards Father Moon in the UK. We feel very grateful to him. He introduced Sudesh to us just before he passed away himself. 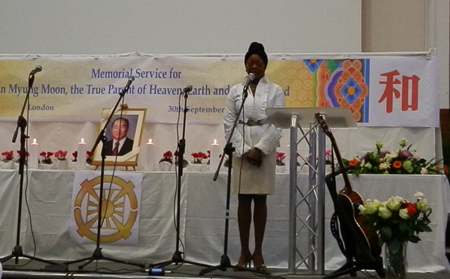 Sudesh offered a Hindu prayer today at Father Moon's Memorial Service. Patti Boulaye delayed her travel overseas to attend and sing at the Memorial Service. She recalled singing for Father and Mother Moon in Abuja, Nigeria last year after Father Moon had given a long speech despite his 92 years old. She sang Amazing Grace and Abide With Me touching the hearts of all those present. 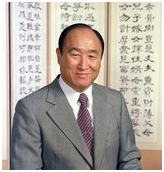 Father Moon was a truly unique figure, who has left his mark on the world, on history and on the future, through his more than nine decades of service and sacrifice, based on living for the sake of others as a peace-loving global citizen. Father Moon's work and example touched all continents and countries and there are so many people better qualified than myself to reflect on different aspects of his unique contribution. However, Father Moon's teachings of peace, reconciliation and love are nowhere more relevant and needed than in his own beloved home country of Korea. Father Moon felt the acute pain and agony of the divided Korean people every day of his life on this earth and in every fibre of his being. What he did to help resolve this needed courage, vision and wisdom. These he possessed in great measure. When Father Moon ventured to Pyongyang and met with President Kim Il Sung, he amazed the world and changed the course of history. All subsequent positive steps that have occurred on the Korean peninsula, every ray of hope, has its genesis in Father's brave steps more than two decades ago. On my own numerous visits to North Korea, I have seen ample evidence of the fruits harvested by Father's work and that of the Unification movement, from the cars assembled, to the hotels renovated, to the buildings and facilities constructed, but above all in the appreciation and love felt by people in North Korea from many walks of life for Father Moon, for Mother, for the members of the family and for the Unification movement. One might say that in the friendship that has now been established between the Moon and Kim families over generations we see in microcosm the future unity not only of the Korean people but of a single human family. For this, and for so much else, I bow in humble reverence before Father Moon.